When mixing, there are normally a few considerations that come to mind. Your choice of monitors, the positioning of them, the plugins you use, your interface and outboard gear, and so on. But at a time when bedroom studios are more common than ever, there's a crucial aspect that's often overlooked: acoustics. If you’ve seen a professional studio, you’ll have noticed that the walls are decorated with felt, foam, canvas or tiles that look like art installations. These are forms of acoustic treatment known as acoustic diffusers. The idea is to prevent reverberations in the room from getting to you. If you’re hearing the same sound bouncing around the room several times, it’ll sound different to how it’s supposed to. This makes mixing that little bit more challenging, and to mix accurately, you’ll want to avoid it from happening altogether! This issue is particularly common with smaller spaces, so if you are mixing at home, it’s definitely worth considering. As mentioned earlier, you’ll want to consider the position of your monitors in relation to your desired seating position. It’s worth noting that this may require some experimentation; the place you expect it to sound best might not always be right! It’s often best to experiment with positioning a single monitor. Once you’ve found a position you’re happy with, mirror it with your second monitor, and experiment until you’ve found the best combination. In a smaller space, the size may limit your flexibility; aim to place monitors equidistant from walls and in the appropriate place to provide maximum space for you, the producer. With the monitors in place, we can consider how to use diffusers to optimise the listening experience. The aim of the game is to make use of a diffuser (or multiple diffusers) to prevent sound echoing around the room and reaching your ears. Audio reflecting off the walls and other surfaces is inevitable; we’re simply going to tame it to ensure that your listening experience is as accurate as possible! As suggested in the diagram, the side reflection points are often the most prominent, so they’re a good place to start with diffusers. It’s also common to see diffusers placed at the back of the room, behind the producer, as these reflections can quite drastically alter your perception of stereo spread. What Makes a Good Diffuser? 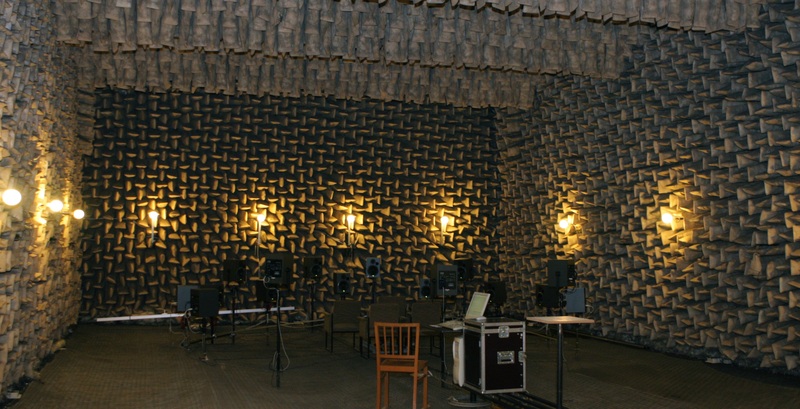 There are numerous ways of acoustically treating your mixing space. You may have read about the effectiveness of egg boxes taped to the walls, or a strategically-placed bookcase. While these can be effective, there are a number of professional-grade options available on the market that have been specially designed to be acoustically effective! There are essentially two ways to approach diffusion; either use a soft surface, or a surface with a variety of angles. Soft surfaces such as foam and fabric will not only deflect sound, but they’ll go some way towards absorbing the sound itself. This is particularly useful for higher, harsher frequencies, as it dampens the overall reflectivity of the room so you hear the purest sound possible. When we say surfaces with multiple angles, think of the egg box reference. The aim is to splinter the reflections into as many directions as possible. To do this, you’ll need a surface that can reflect in as many directions as possible. That’s why so many acoustic diffusers in professional setups resemble some sort of stylish modern art; they can be quite intricate! 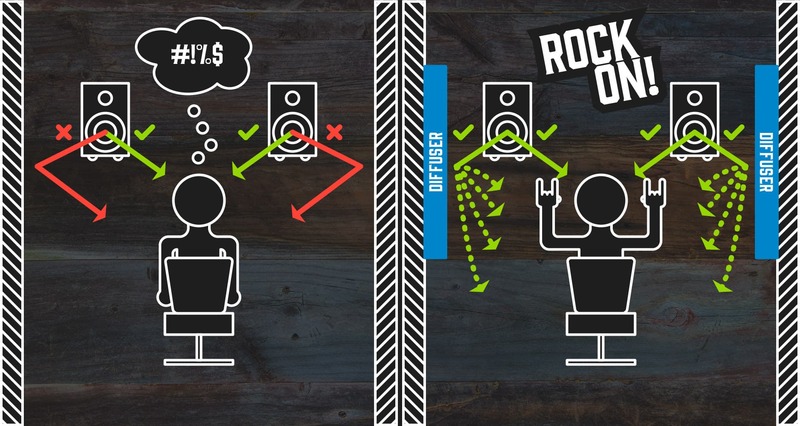 Much of the acoustic treatment gear on the market will fit into one of these two categories. Take a look at some of our acoustic treatment range below for some ideas! We aim to cater for every price point and every type of studio. If you have any questions about our range, please don’t hesitate to get in touch!